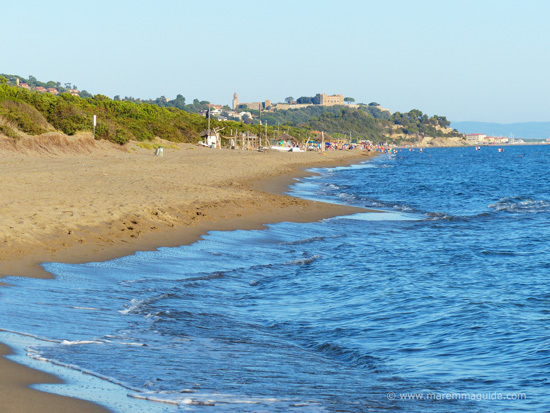 Roccamare beach near Castiglione della Pescaia is one of Maremma's best beaches. And with more than a hundred truly gorgeous ones along this part of the Tuscany coastline, it takes a lot for me to say that. 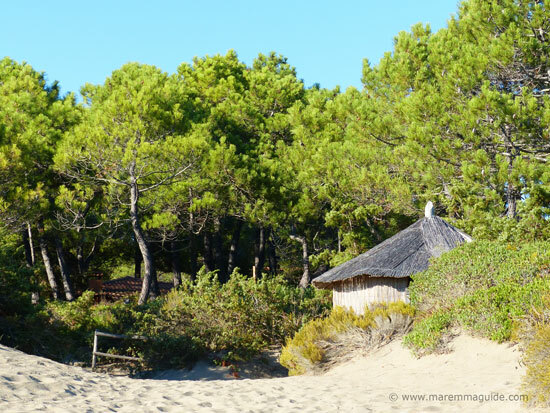 I have lost count of the number of times I have driven alongside the pine wood - "le pineta" - that backs this beach on my way to or from the town of Castiglione della Pescaia hoping to get a closer glance of the beach. And on countless occasions over the years I have tried to find a space to park my car. On my first attempt, what looked like an access road turned out to be the (guarded) entrance to a private estate within the pineta, the Pineta di Roccamare. Lots of lovely independent villas built in the 1960's between and under the pine trees, with their own part of the pine wood and a private area of the beach all to themselves. Where writers, conductors, film producers, actresses and the a king have made their beach homes over the years. Sophia Loren and Claudia Cardinale to name but just two. Need any more indication that it is a particularly lovely location in Maremma? If the thought of staying in one of those private villas interests you, you'll find the information you need near the bottom of the page. A car drove out of the only tiny area that I know where you can park as I approached and so I entered straight after it. When I say parking is limited, I mean it. 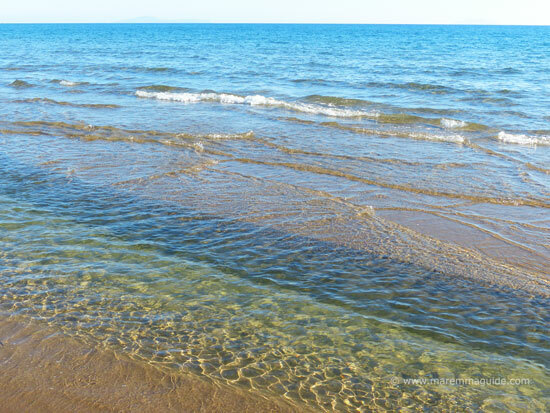 There are three "spaces" on a sandy patch from which the footpath through the pineta to the beach starts. Four, perhaps, if you have a very small car and don't mind risking the other three backing into you on their way out. 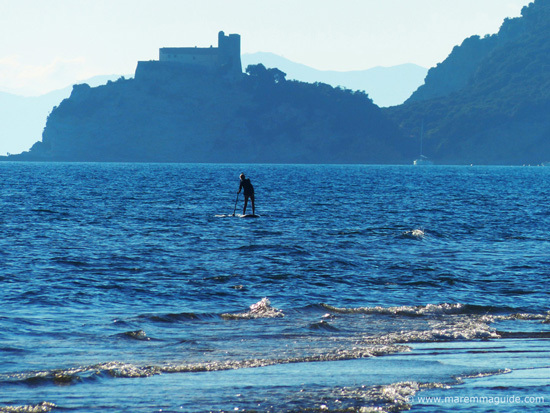 Places to leave you car may be non existent, but Roccamare beach is readily accessible on foot and by bicycle. There is a purpose-built five kilometre long designated cycle path - called the "pista ciclabile Castiglione della Pescaia-Bivio Rocchette" - that takes you from the town of Castiglione della Pescaia to just before the junction of Le Rocchette village. Ending at the same pine wood footpath. The "sentiero" (path) is also easily traversed by bike being wide, flat and sandy. Alternatively, you can do as many locals do throughout the year, and walk along the shoreline from the promontory of Punta Capezzolo and its beach, along the beach of Riva del Sole to Roccamare, and then on again to Rocchette beach and the promontory upon which sits the fortress of Rocchette. And back again! And who wouldn't when the scenery is so beautiful and the beaches so lovely. 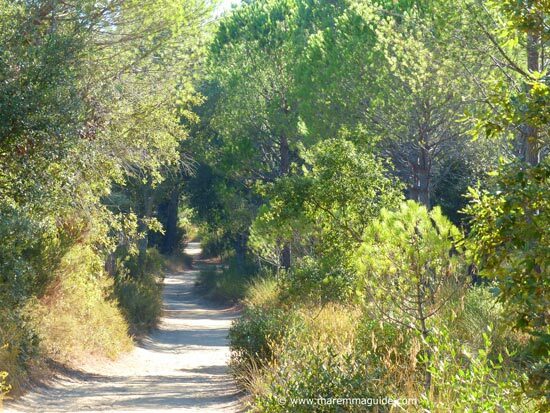 The walk through the pine wood to the beach is deceptively longer than the two minutes you might think it will take you from having glanced the sea as you drive along the old Strada Provinciale SS322 delle Collacchie to Castiglione della Pescaia. It will will take you about ten minutes (less if you walk fast like I do). View of the pineta from Castiglione della Pescaia in February. 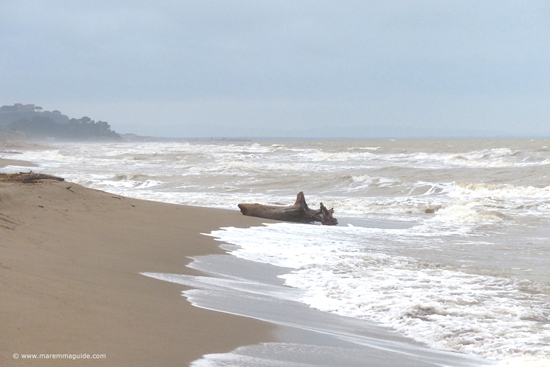 The Pineta di Roccamare - the pine wood, not the aforementioned private estate named after it - runs the length of this stretch of Castiglione della Pescaia beaches, a full eight kilometres, beginning at the promontory of Punta Capezzolo in the south and ending at another, Le Rocchette in the north. Private access to the villas in the pineta. Seeing the beach for the first time I am convinced that the secret to its beauty and the its cleanliness and the lack of roadside or designated parking areas. You have to make a decision to walk a few kilometres from town to get here, or get the whole family onto bikes. (NB. Castiglione della Pescaia does operate a free bike hire system, where you pick up a bike from one location and can drop them at another.) That, and the exclusiveness of the local homes and their owners. For unlike its sister beach Rocchette (I hesitate to write ugly sister, but if you visit its very far end and walk from the round car park to its sands, you will know why I have...), Roccamare is stunning and unspoilt and its pineta is how a pine wood should be: devoid of litter. And I visited after a long and very hot summer when the beaches would have been at their busiest. 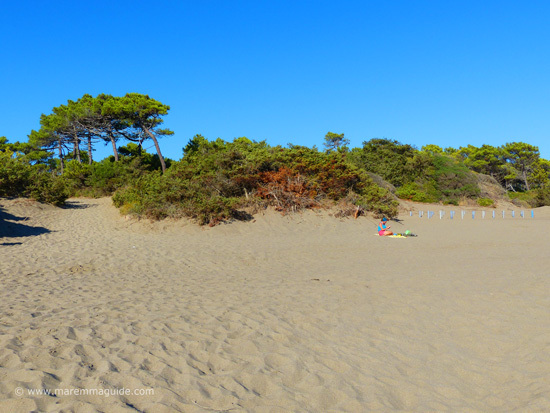 It has my vote as one of the best beaches in Maremma if you like long stretches of golden sands, lapping crystal clear waters, and a huge shady pine wood in which to relax. I got chatting with a local - I usually do! - and, apart from the fact that Roccamare beach is clearly his very favourite beach and that, like me, he considers September to be the very best month to be on one of them, he told me that it is always a special place throughout the year and that even in August doesn't suffer from overcrowding. 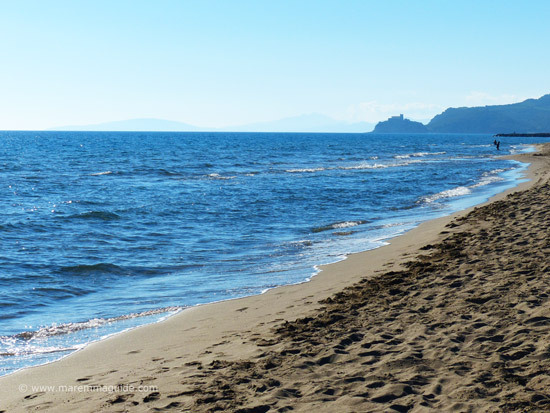 Something worth knowing if you are looking for your own patch of sand on a Maremma beach in the summer. The view south to the headland of Rocchette upon which sits its fortress: beyond begins the Gulf of Follonica. 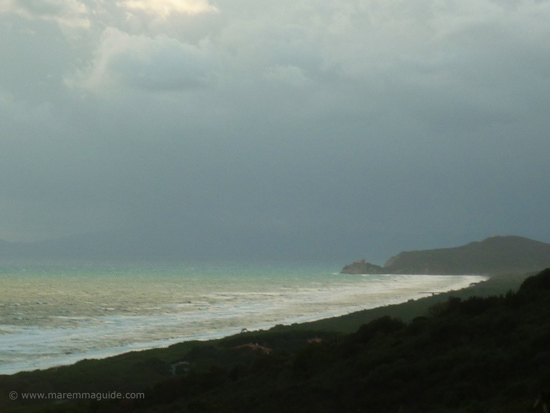 Maremma is a special place to visit anytime of the year, even in winter. And especially her beaches. For they offer endless opportunities for wonderful walks, and beachcombing along sands covered in driftwood of all sizes and shapes. The satellite map for the beach. 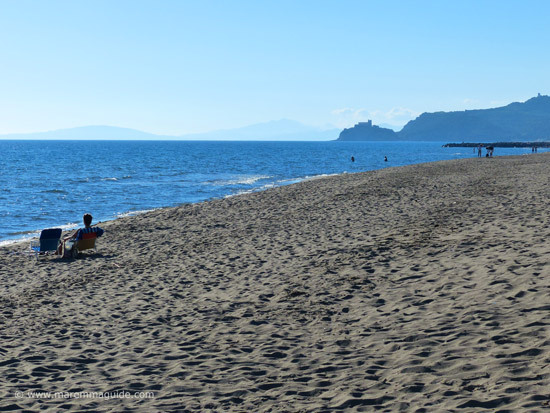 The nearest campsite is the Camping Maremma Sans Souci site located just a little south at the beginning of Riva del Sole beach, three kilometres from the centre of Castiglione della Pescaia. Open from 23 March to 3 November. It has its own private part of the beach too.